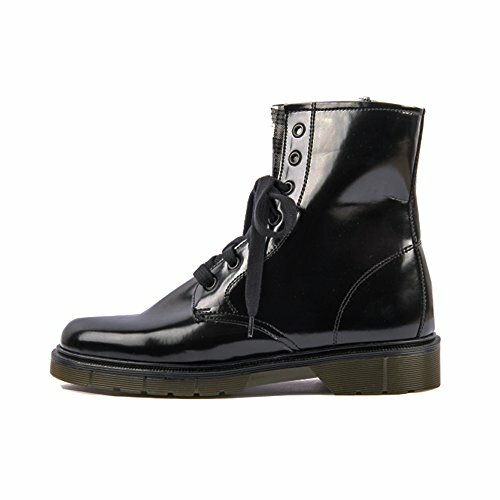 Looking for a solid pair of vegan waterproof boots? Here are 10 that you're going to absolutely love for a variety of styles and uses. And yes, we've got options for both men and women. Let's get to the list. Men's mid-calf length all-weather boots with rubber shell and outsole. Wearable in all seasons and well-suited to all sorts of outdoor activities, including boggy activities as the name implies. Can be worn in temperatures from 60°F to -40°F. Antimicrobial-treated insole to keep odors out. Built-in handles for putting on and taking off easily. Brown upper and black lower. Made of man-made and rubber materials. Sole designed to be non-marking (aka safe for floors). Pros: Great for all weather. Durable, warm and smell resistant. Cons: Not ideal for hiking or rocky terrains. Not very stylish. 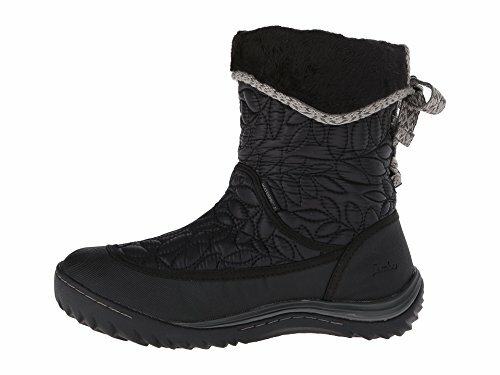 Women's black quilted nylon boot made of 90% nylon and 10% rubber. Has a stitched leaf pattern on the body and slouchy fold-down top. Fleece lined with memory foam insole for extra comfort and warmth. A rubber sole provides grip in the snow and slosh. "Designed by women for women." Pros: Will keep your feet toasty and dry in a snowstorm. Good traction for all colder weather conditions and terrains. Feminine, stylish and sensible. Cons: Runs a little tight — go larger if you like room for thick socks. Burgundy men's ankle boot with round toe, ruched layering and antiqued metal buttons. Has a full-length zip closure on the right side of the boot so you can get in and out of it easily. Made of ultra soft vegan leather. Has white contrast stitching on the heel and throughout. Flexible outsole with good shock absorption. Fleece-like lining for padding and comfort. Advertised as vegan: Yes. The product description says "vegan leather." Pros: Casual and sylish — no need to take a pair of rain boots with you or worry about getting caught in afternoon showers. Comfortable inner support with contemporary outer flair — complete the look with rolled cuff jeans. For folks looking for a convincing faux leather boot: the vegan leather is real-looking. Cons: Runs large/wide. The textile lining is too warm for hot environments, but it's not super warm — may only work for limited seasons and environments. 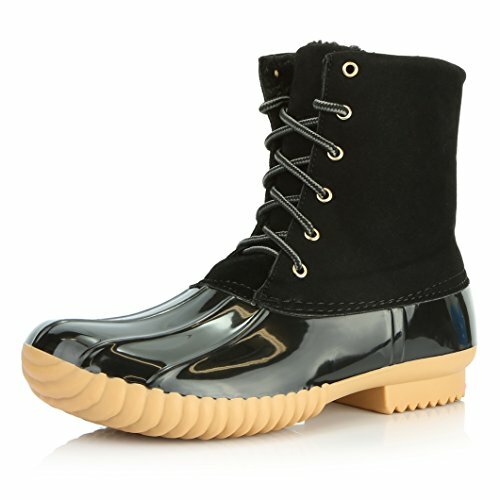 Women's rain and snow ankle duck boot with rubber sole. Combination of a zip-up side and lace-up front provides a close fit. Shiny navy foot and matte tan body. Non-slip tread so you can walk on rain-slick floors without trouble. Pros: Inexpensive, fashionable and trendy. Duck boots are in style and go great with skinny jeans. Can double as a winter boot and be worn in perfectly sunny weather without looking silly. Non-leather duck boots can be difficult to locate. Cons: Runs small and might get hot above 50°F. Some reviewers have found these boots to be durable, but others have mentioned receiving boots with wonky sewing. Tan men's lace-up work boot with black padded collar paying homage to the classic Timberland boot style. Heavy-duty tread for good grip and shock absorption. Mesh lining to help keep the foot comfortable and dry. Padded tongue to reduce front chafing. Advertised as vegan: No, but the description indicates man-made materials. Cons: Shouldn't be expected to last for years if worn extensively. Especially considering the ankle height, probably not great for snow in case you work outdoors in a snowy environment. Stylish, ethically-crafted women's chestnut brown work boot with laces and rounded toe. Ankle height with an elegant slanted collar that's higher in the back than in the front. Made from breathable faux leather. Rubber sole and cushioned insole for comfortable walking and traction. Vendor lists these boots as "PETA approved." Pros: Ethically sound, sturdy and beautiful — these are almost too attractive to consider work boots. On the other hand, they should be wearable for work, play or recreation. Pair with legging, jeans or an a-line skirt. Should be wearable in warm and cool weather. Cons: Expensive and probably not meant for rougher terrains, and definitely not hiking material. Water resistant, which may mean that they won't do well in a downpour so much as light rain. 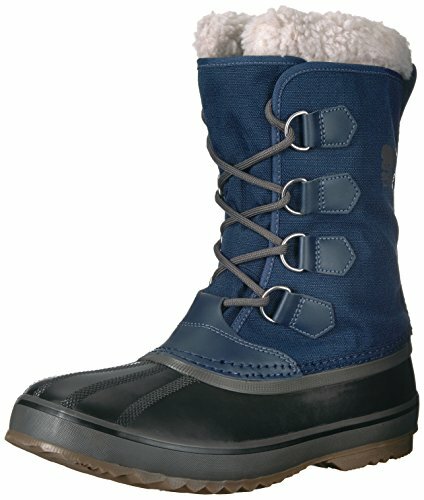 Navy blue men's insulated snow boot that laces up in the front. Removable felt inner boot that makes for simple washing. Graded for temperatures down to -25°F. Mid-calf height should provide protection from a good foot of snow. Thick felt cuff that feels snuggly and adds a polished look. Made from synthetic and textile materials. Advertised as vegan: No, but they're synthetic. Pros: Warm, cozy and easy to keep clean. Cons: According to some reviews, there is little breathability and much warmth, making feet sweat and then freeze in very cold weather. Despite the frosty weather rating, these boots might not be built for frigid northern winters. Mid-calf to knee-high women's black duck-style rain boot with vegan leather upper and rubber foot. Antimicrobial-treated to prevent odors and dampness. Stretchy elastic panel on the back of the calf. Full-length zipper on the right side of the boot makes it a cinch to put on and take off. Faux fur lining for warmth and coziness. Advertised as vegan: They're described as vegan nubuck. Pros: Soft, snuggly, sleek and chic. Could pair with any outfit, especially since black goes with everything. Seems like the ultimate rain boot for an oversized sweater and trench coat. Cons: Not warm enough for very cold/wintry weather. Edging toward the pricey side. 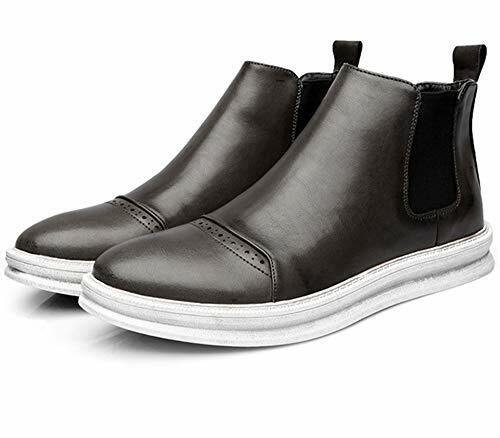 Gray men's slip-on microfiber Chelsea boot with pull tab on the back and wing tip-like design running across the toe. Thick, white rubber sole adds slip resistance and sophisticated yet casual style. Short ankle style with elastic panels on the sides to stretch when you put it on. 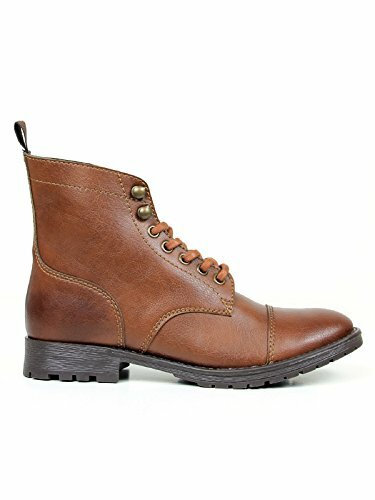 Advertised on Amazon as unisex, though these boots are offered in men's sizes. Advertised as vegan: No. They're listed as microfiber. Pros: No need to plan your wardrobe around rain boots on a drizzly day. These modern Chelsea boots would complement neutral-colored trousers or slim dark wash jeans nicely. Unisex-friendly in style. Cons: Nice enough to wear if you want to go slightly dressier than totally casual, but they're too much like sneakers to wear with more formal attire. No mention of any arch support. Women's shiny black combat boot with lace-up front closure. Made sustainably by a 100% cruelty-free vegan footwear company in Italy. Low-heeled rubber sole for comfortable wear and good grip on the ground. Rises above the ankle and laces up all the way to the top. Pros: All-around ethical: sustainably built and animal product-free. Trendy and high-fashion — wear with cropped pants for a modern look or a babydoll dress for a 90s grunge vibe. Would probably last for years to a lifetime due to quality and craftsmanship.